Even as electric bicycles are riding high on a popularity wave in Beijing, traffic officials have decided to phase them out by 2005. The user-friendly features of these vehicles -- they are affordable, require no driving licence, no insurance, no road tax and can be easily recharged -- have sent their numbers soaring on the roads of the Chinese capital. 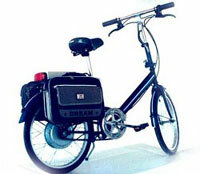 Electric bikes have also provided the people with a convenient and affordable alternative to cycles and the city's inadequate public transport system. Most importantly, being zero-emission vehicles, they are environment-friendly too. But for Beijing's traffic department, battery-powered bicycles don't fit into the scheme of things. The authorities argue that as they run at a speed of 20 kilometres per hour, they are too slow to move alongside cars and too fast for cycle lanes. Since the officials are not sure about which category to put them in, they are refusing to issue licence plates. These are ominous portents for small firms manufacturing this bike-motorcycle hybrid, which lack the political clout of carmakers. But if electric bikes are grounded, the worst hit would be Beijing's common commuter whose health bills are already on the rise.